Heat oil in a handi. Add cloves, cinnamon, cardamom and bay leaf. Saute a while. Add chopped onions, green chilies and fry for 2 mins. Add ginger-garlic paste and mint leaves. Saute a while. Add chopped carrot and green peas. Mix well. Add turmeric powder and coconut milk. Cook for 2-5 mins. Add rice, salt and 3 cup water. Cook it covered for 10-15 mins. Serve hot. 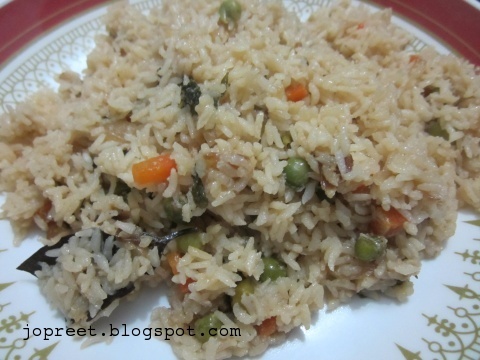 Beutiful pulao, love it as it has peas and carrots. Generally pulao is one of my favs. This one looks colorful. pulao and kuruma looks very tempting…. 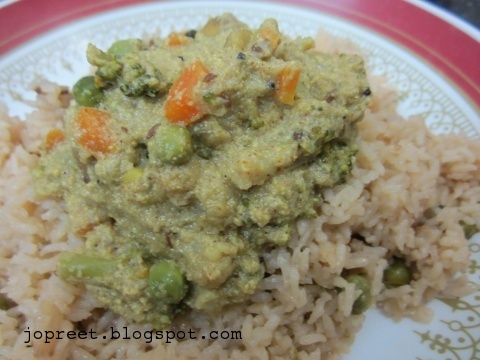 Lovely and fabulous pulao….my fav carrot and peas pulao.